Some people like to come and browse around looking for gifts that you can’t buy in the shops. Others get here early to grab some of the freshest fruit the area has to offer. There is an amazing range of goods sold on the day from Mrs Stocks’ pumpkins, Mr Brown’s local honey and even the many crafts created by super talented local people. The local musicians all support the markets and take their turn to entertain you. 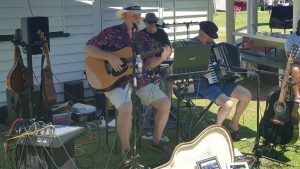 Folk musicians, country singers, cover musicians, original artists and even the full brass bands. You never know who will be performing so be prepared to linger a while. The local football club has now taken on feeding us all delicious breakfast. The signature bacon and egg roll enjoyed for so many years from the Emu Park Kindergarden has been lovingly recreated by the footy club. They have sausage on bread or roll and hamburgers as well. Other food options often include the Lazy Cow, (don’t ask), Ed’s Donuts, Thailicious and of course the ice cream van. My Mojo has been able to make the last couple of markets to cater to lovers of soft serve ice cream. Angela and her mum serve delicious traditional ice cream scoops on regular or waffle cones and also make coffee. Coffee Maid is another options for lovers of coffee and other coffee vans sometimes. 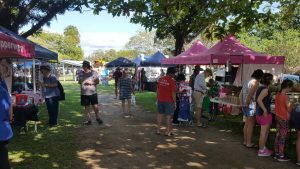 Make sure you mark your calendar for a few hours at Emu Park on the third Sunday of the month.